What: Case for http://www.mitpressjournals.org/itgg Title: The Future of Manufacturing Deadline: complete first draft of your essay by May 1st. Length: Case narratives are 5,000 – 10,000 words. (10 – 20 pages including graphics, charts, photographs). Further guidelines in PDF. audacious statment: Democritization of precision machinery Mass Customization Garage Manafucturing revolution Subtractive Rapid Prototyping allows structural goods to be made with no cost to make changes. what to do with this information Purchase only from micro-manufacturers that open-source their products to enable the highest velocity of innovation. No need to purchase problems that just solve one problem, vote with your dollars and purchase products made in a sustainable way with collaborative methods and global information sharing. (Below From Colby - In progress) Process: (Highlight in RED anything you dislike, Yellow Questions, Green anything you love) Outline talking points. Create outline. Turn into short paragraph form. Cut down to best content. Expand narrative. Make cohesive. Cut content. Outline: (From Colby - early start.. ) 1. Intro specification: An introduction to the case comprised of a few tightly written paragraphs that give the reader a working understanding of the innovation and a sense of the magnitude of the challenge addressed by the innovation. IE : Open source ecology is an effort to build open source versions of the 50 machines necessary to re-create the comforts of modern civilization. 2. Body specification: The body of the case is a description, usually in chronological order and first-person narrative (if author is the innovator) of the process put into action, including obstacles (both those overcome and those not overcome), and changes in strategy dictated by circumstances. The writing process should focus on clearly explaining the process, the actors, and the technologies involved. Narrative flow can be provided by drawing readers’ attention to critical junctures—crises, transitions, and shifts in strategy. Authors should emphasize motivation, action, and impact. Through out, authors should avoid the passive voice. IE: We began by identifying and framing the problem We created a wiki for the machines We researched and engaged with special purpose communities and existing projects We created Factor e Farm as a prototype / dog-food location We created initial design prototypes reflecting our concept We engaged in testing We engaged in outreach and fundraising (TED, Kauffman, Shuttleworth) We engaged in community building We prepared to scale manufacturing We iterated ^ 3. Significance section spec: The final section should reflect on what was accomplished by the innovation: its impact on people, practices, and places. We are particularly interested in impacts on governance at all scales. Authors may wish to conclude with a short discussion of where the innovation is headed in light of its impact to date and changes in the environment. See reference here to governance: Governments compete and maximum welfare exists by maximizing innovation and distribution of innovation : See Adam Smith Resiliency: Governments use subsidy and other tools to promote resiliency when efficiency optimizes beyond the point constituent security Global Supply Chains - foreign policy dependency Natural disaster resiliency Equity and distribution of wealth Enabling of : https://en.wikipedia.org/wiki/Jeffersonian_democracy GDP is a function of human labor * productivity (technology/efficiency) * natural resources. Stabilizing or declining population and natural resource situations in parts of the world imply that GDP growth can only continue through gains in efficiency and innovation. Distribution of wealth for harmonious society. Efficiencies made through IP have less trickle down. Creative destruction in capitalism -- software eating other industries.. now means of production. Foriegn policy: Aid to Africa -- grain dumping on an agricultural economy vs open source user serviceable means of production :: OSE Means of dissent -- does one truly have the means to dissent if they cannot as a group control their means to the production and distribution of basic survival necessities.. IE if the government controls food water and transportation.. how would one rebel? 4. We encourage authors to employ text boxes or “side bars” to highlight illustrative anecdotes, core concepts, notably policy impacts, or technical specifics. These boxes can be useful tools for elaborating upon important topics without disrupting narrative flow. From conversation with Michael.. stories.. factor e farm, CEB at night, Yoonseo Thiel fellow, community development, story of ironworker. Community Crops, Turbine Flats. Marcin worrking, physicist, seclusion to creating community. Smash the tractor into a ditch, improvised houses, rapid prototype. First impressions, challenges, failures, community, Marcin monk-ness, crisis points. Truefan. Writing in book. Aug 6 Draft.. Influences (SU). Aaron’s story. Much as Wikipedia sought to democratize knowledge and the open source software movement sought to democratize computing, Open Source Ecology seeks to democratize material well-being. and make distributive the engines of material wellbeing. We design and manufacture, and help others design and manufacture, devices like tractors, bread ovens, circuit makers, and the other devices from which the basic comforts of modern society originate. We design these tools in a non-traditional way, and with non-traditional goals in mind, and we design them to work together. We call our interconnected set of devices the Global Village Construction Set (or GVCS), a set of the simplest 50 modular open source tools designed to provide modern comforts and basic material self sufficiency.The GVCS is defined as a minimum set of technologies necessary to create advanced civilization from locally-available 'dirt and twigs' with 12 people and 1 year of time - starting with a container-load of GVCS tools. The tools are designed to build each other from raw feed-stocks, to be user serviceable and modifiable and to have swappable Lego-like modular components and quick connect couplers -- much like your childhood erector set. Combined with the documentation in the Civilization Starter Kit, an economy could be created and maintained by a small group of individuals. The open, collaborative nature of the project means that the tool set can be independently adapted for the American technologist, the African farmer, and the pioneering lunar colonist. 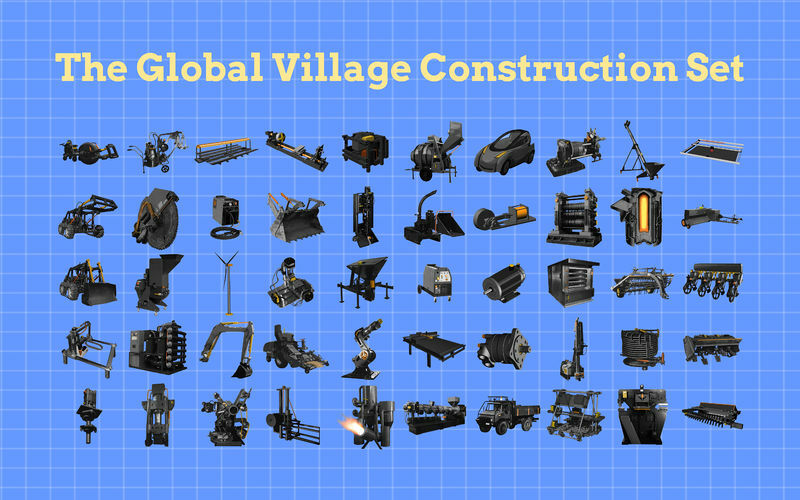 In contrast to the iPhone -- designed in the US, made from African minerals, assembled in China, with parts from Japan, the GVCS is designed by contributors all over the world to have a supply chain no farther than your back yard, and the local scrap heap. Its subcomponents range from basic manual manufacturing to highly automated software-based precision tools. The GVCS is the natural intersection of the open software and open hardware movements, sustainability, and basic human needs. Open Source Ecology began when Polish immigrant farmer Marcin Jakubowski's tractor broke down in rural Missouri, and he designed a new one and put the design on a wiki. Marcin had chosen farming as an unlikely profession, after a crisis of meaning he experienced upon completing a fusion physics PhD program. A natural tinkerer, Marcin found that his tractor was very difficult to fix, and that he could not afford expensive replacement parts. His choice to design a new flexible easy-to-fix tractor and open source it inspired a community of DIY contributors and through his vision, the birth of a new collaborative movement. Marcin began researching and engaging with special purpose communities and existing open source projects and collaborators, and to begin to piece together a larger plan. His farm was re-purposed as a land trust and became the prototyping and dog-fooding location for open source manufacturing. The buildings and new generation devices began to be built using his own tools and technologies. Initial design prototypes were created for several machines, and as these prototypes were refined, their testing and documentation was put on the wiki as well. The internet community responded not just by contributing designs, but by sending money. Jakubowski created one of the early crowd funding campaigns, designing a system where donors could sign up for recurring $10/month PayPal donations. These "True fans" rose to about 600, and Marcin calculated that development of the initial machines could be achieved. Having cleared $25k in sales of the initial prototypes last year, it became clear that additional development could be bootstrapped. During this time Marcin attracted the attention of the TED conference, and was both invited to speak and to be a TED Fellow. The experience was explosive. His TED talk became one of the most viewed talks, the community rose up funding a Kickstarted campaign, and donations from Ewing Marion Kauffman Foundation and other leading foundations arrived. South African open source legend Mark Shuttleworth, creator of the Ubuntu Linux operating system, offered his organization's assistance by providing a grant large enough to significantly expand the project prototyping. The investment in video and detailed online documentation for the project, and the attention of early ecological journalists and documentary film makers enabled unprecedented access to the team's progress. Social media outreach also began attracting key contributors, documenters, volunteers, and collaborators in larger numbers. During this phase, a more intensive community building effort began at the Factor e Farm – the headquarters of Open Source Ecology. We prepared to scale manufacturing and design, using the GVCS tools to build a green manufacturing facility and habitation buildings on-site utilizing locally pressed bricks from our compressed earth brick press prototype. It was during this time that I met one of the key contributors, an incredibly bright 19 year old Korean-Canadian named Yoonseo Kang that had come to the farm to work on the GVCS rather than attend Princeton. I met Kang in the middle of a field, with his laptop and hard hat, updating the Arduino software on the brick press late at night in the pitch black so that the facilities could be completed before the first frost. Yoonseo, despite border and immigration issues and the initial disapproval of his parents went on to win the Thiel 20 under 20 Fellowship for his work at OSE, paying him $100,000 to continue his contributions and postpone college attendance. In the time since, collaborators and interested parties have come out of the woodwork, and the organization now faces the challenges of growth and the simultaneous development of additional machines. While the team still searches for high level contributors with the skills needed at the farm, spontaneous replication of the GVCS devices has started occurring in the wild and showing up via emailed photographs and video. Open Source Ecology's rise to significance was made possible by the environmental conditions seen in the rising tide of the open source, open knowledge, DIY manufacturing movements. In order to achieve the current level of success, a number of innovations were made by both the open source community and the OSE core team. The first was the application of existing software development paradigms to the physical world. This is seen as an emerging trend, and is well documented by collaborator Joe Justice's Team Wikispeed open source car project as part of the Progressive Automotive XPrize. By emphasizing rapid prototyping, modularity and re-use from computer science paradigms, and by emphasizing agile development and scrum management processes, the budgets, team size, and timelines for the projects lowered dramatically. Rather than borrow more directly from manufacturing paradigms such as kaizen, kanban, and six sigma, the movements oriented more closely with their software counterparts. OSE has made a number of novel innovations in this area in order to meet its mission. One is a documentation procedure we call the Fabrication Diagram. The Fabrication Diagram is a diagram that facilitates the build of a prototype machine. The diagram contains a visual representation of all fabrication steps and parts building on the same ideas that allow aspiring urbanites to assemble Ikea flat pack furniture, but with much greater capability. The visual representation allows the fabrication team to understand which steps may be taken in parallel and which steps are done sequentially and in which order. Each step links to a fabrication drawing. Supporting files are arranged in folders tagged to the step. By visually placing fabrication steps horizontally on a page, we indicate to the builder that several steps can be taken in parallel. Items going down the page, or vertically down - are subsequent steps that have dependencies on prior parts being fabricated. This technique is useful when a team of fabricators is involved in production, such that fabrication can be done in parallel as quickly as possible. Using this method we achieved aim to achieve a build of a large compressed earth brick press in 1 day with 8 people. The press can be constructed from relatively inexpensive parts and initial prototypes have been sold for a healthy profit ($5000+), with commercial competitors costing 5 times the price for a comparable machine. The second element was the ability to stand on the back of existing innovations, and other open source communities. Already mentioned were the contributions of crowd funding services and social media development tools, but the team relied most heavily on simple tools like Wikipedia's Mediawiki to document the ballooning database of designs, Inkscape vector art and Google Sketch Up to allow the contribution of designs, and inexpensive Arduino open hardware kits made control devices possible. These tools democratize the contribution process in crucial ways. Tools as mundane as Open Office and Google Docs are cannot be taken for granted indispensable for contributors in regions where a Microsoft office license may cost as much as a year's income. Finding good, freely available CAD software is still a problem. However, Google Sketchup can be more effective because more users have access – and a swarm of people on Sketchup can produce designs and fabrication drawings faster than a single draftsperson on a proprietary CAD platform..
A concern posed is that a new design initiative involves a small group of engineers 're-inventing the wheel' for the developing world in neglect of the benefit of accumulated engineering knowledge. While our design principles dictate that we adapt traditional designs to be easy to manufacture and modular, we rely heavily on the shoulders of the entire body of manufacturing innovation. We start with industry standard design and strip it of all unncessary features. As a distributed open source collaboration, one of the most common types of forum posts we receive is of the type "I worked for many years as a Systems Engineer for Boeing, and am now retired. I have started putting some pages together on the subject in the wiki. It’s very preliminary, but I intend to keep working on it." Like other open source movements, people want to work on things because they have them in their blood. The combined knowledge of the community goes into every innovation through our distributive and iterative prototyping and replication process. We have even run design competitions using GrabCad to crowd source the best design. Any out of touch design elements are dog-fooded locally and improved or wholly re-factored by replicator and contributor feedback. The OSE License is an important and challenging aspect of design that makes this possibile. OSE's license, called "The OSE License for Distributive Economics", uses the Creative Commons CC-BY-SA 3.0 license similar to the GPL license on which linux is based. Our original license was based on a public domain attribution-based license similar to BSD, the open source operating system on which Apple's OSX is based. The viral "Share Alike" aspect of the new license allows contributors to use the designs for free for any purpose, provided they contribute back modifications under the same terms, whereas public domain does not impose the same restriction. While our team does not endorse coercion of any kind, we chose this route wanted to prevent community innovations from being orphaned and to maximize total innovation, and we decided that the Share Alike attribution best reflected our values and encouraged our public goals. In addition to this license, we require suggest the explicit ethical intent of creating a "Distributive Enterprise" Distributive Enterprise is a term that describes an enterprise that not only has an open source product, and a user contributed design, but which also open sources its entire business plan and procurement strategy. A Distributive Enterprise is a social enterprise that focuses on open economic development. In particular, it is a transparent enterprise which maintains the open replication of such an enterprise - independently by others - at the core of its operational strategy. You might think of it as an "Open Franchise" system that focuses on replication of itself by others. By definition this involves documentation and training materials, wide access to required technologies, and other aspects needed to enable collaborative production and repeatable results. Without these characteristics modifications do not fully achieve their goals as part of a system of economic delocalization and flexible digital fabrication built using community knowledge. We call the minimum unit of complete production the OSE Microfactory, and a major goal is to have these internationally distributed within the next 5 years. The moral aim globally is that we remove material constraints from determining the well-being of humans, as production is no longer an issue of control and power. The goal is to address the issue of artificial scarcity and disparity of wealth as related both to peoples' lifestyles and to global geopolitics and corrupt leadership. Another goal is to embody a higher purpose in the economic system and in lifestyle choices. To test the usefulness and purpose of its results - a distributive enterprise dogfoods its own products as we have done at Factor e Farm in using our own tools to build our tools and facilities. Participants in distributive enterprise aim to blend their lifestyle with their work - as an expression of consistency between one's values and one's actions. This leads to an increased interest in addressing pressing world issues by making citizens directly connected to the literacy of production and consumption.The Distributive Enterprise concept builds upon the notions of appropriate scale proposed by E.F. Schumacher, upon the concept of economic swadeshi proposed by M.K Gandhi - and it is updated by bringing it into the digital age where information can be shared readily and globally. The Distributive Enterprise model is an expression of human-centered economics of collaborative production - whereby citizens regain their autonomy in a complex world. This goal contributes to a parallel Open Source Economy, similar to the open source software movement, that captures a portion of the production of food, energy, housing, fuel, transportation, electromechanical technology, and microelectronics. An Open Source Economy is defined as a maximally efficient economy - where efficiency means access to innovative capacity in the greatest number of hands, enabling producers (not makers – that term is tainted with frivolity in my mind) with any level of capital resource to participate and to have a structured franchise-like blueprint to do so. All wealth comes from sunlight, rocks, soil, plants, and water - the abundant feedstocks of modern civilization. We are creating an open source toolkit that allows people to convert these resources directly to a modern standard of living. Around the world now there is an emergence of maker spaces and hacker spaces in urban areas. Similarly there is a strong growth of a different sort of maker community in midwest and rural costal areas where the economies are more oriented toward agriculture and the means of production. One such community is Turbine Flats. Located in a large warehouse in Lincoln, Nebraska, Turbine Flats combines software development shops, marketing, branding, and R&D, in common housing with woodworking and metal working operations. 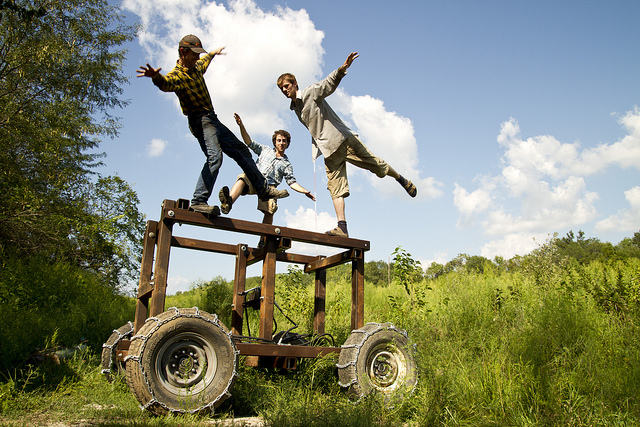 MasterCraft in Omaha is an even larger prototyping location and artist community. Similar organizations have developed with unique flavors across the nation, many of them operating purely for the education and entertainment of their patrons. Some, like OSE, have located in regions with minimal legal restrictions that would prevent essential experimenting, while others have propped up adjacent to industry. Artisan's Asylum in Massachusetts has grown a giant hydraulic hexapodal walking robot based on similar hydraulic technology to OSE's LifeTrac tractor as a creative outburst from the military industrial robotics center nearby. With the democratization of precision machines, automated manufacturing, and open source plans and business models, all the participants have a larger and larger body of resources to build from whether motivated by fun and education, profit, or social benefit. •.Hardware is Customized: Devices are optimized for environments in which resilience, adaptation, end user serviceability, modification and other goals are paramount. Modification and modularity allows special purpose efficiency to exceed general case efficiency, and at lower cost. Mass Customization and "Long Tail" innovation opens new markets, and allows that satisfaction of market niches previously too small to be addressed. When I discuss Open Source Ecology with policy analysts a variety of mundane topics come up such as the reduction in sales/use tax receipts from an economy increasingly oriented toward self production and bartering. This may be counteracted by a localization of the economy, increased local tax receipts, and a decreased dependence on imports for basic staples. In recent weeks, the State of California has finally succeeded in getting large internet retailer Amazon to withhold sales tax after 20 years of interstate use tax freedom. No matter the size of budget deficits, given the incredible variety of tax strategies across state and national jurisdictions, I have no doubt that governments will eventually notice and respond to changes in their receipts. More important however, is the larger upside for the economy and the individual. If we look at the US federal budget we see that less than 25% is spent on non-military aspects that we would call governance. The primary and growing component is entitlement spending directed toward the health and material wellbeing of our aging population. If technology improvements can be successful in fueling economic consequences that lead to increased and more equitably distributed wealth and material wellbeing, then I think we are better first to focus on their direct economic consequences than on their effect toward existing tax receipts. As much as the garage hackers fueled the computing boom, the garage manufacturing revolution is beginning to enable manufacturing that was once was reserved for a few corporate R&D departments. This is exactly the kind of creative destruction that economist Joseph Schumpeter would have been proud of. As investor Marc Andressen has commented, all industries are being "Eaten by Software" That now includes hardware, the industrial system (means of production is a Marxist term), and the physical world. As Andreessen said 'Over the next 10 years, the battles between incumbents and software-powered insurgents will be epic". And best they be, as stabilizing or declining population and natural resource situations in developed parts of the world imply that GDP growth can only continue through gains in efficiency and innovation. GDP is a function of human labor * productivity (technology/efficiency) * natural resources, and with the other two factors down or flat for the near term in the developed world, our growth based economy is wholly dependent upon improvements in efficiency. 90's manufacturing powerhouse Japan is facing record debt levels and has recently reported the unthinkable, a decline in real GDP combined with the stigma of a continually falling population. America is only saved by immigration and first generation immigrant birthrates. As Adam Smith pointed out in "The Wealth of Nations", Governments compete and maximum welfare exists by maximizing innovation and distribution of innovation. In the June ruling between Google/Motorola and Apple, explaining why he wouldn't ban Motorola products from the shelves, famed Judge Richard Posner said: "An injunction that imposes greater costs on the defendant than it confers benefits on the plaintiff reduces net social welfare." Posner later stated that "most industries could get along fine without patent protection" and in doing so revealed the elephant in the room that every technologist is aware of: The patent system in most industries is hindering innovation, and precisely counter to its raison d'être is actually reducing net social welfare. Similarly the argument for nationalistic protectionism by closed source seems discredited in the consumer sector, given that China has already demonstrated the ability to copy and manufacture nearly all products and services. Bringing them into an innovation ecosystem allows other countries to benefit from their innovation contribution as they increasingly posses the highest level of manufacturing expertise for key consumptive items. Estimate the number of first world citizens involved in the innovation process, and then consider the possibility of engaging millions if not billions of African and Asian inventors. Given that innovation is a recombinant search process it is clear than we gain globally from lowering the barriers to entry. That economies effectively allocate resources to solve problems is not only one of the most robust findings of our century, it is also demonstrated by the very nature of our thought. As AI researcher Eric Baum has noted, randomly generated computer code, when moderated by reinforcement learning inside an artificial economy will reliably generate solutions to complex problems. The Western world has resoundingly and correctly convinced us that economies allocate resources more efficiently and spur innovation more regularly that centrally planned systems when given the right operating environment. However, we must be aware that just as in computer software experiments, economies optimize only for efficiency in the characteristics by which they are measured or constrained. We as humans must also interject our values in the form of appropriate constraints to achieve the outcome we desire. For example, in a capitalist system, supply chains become progressively more efficient through competition, but unlike the internet which was designed for fault tolerance, they do not become more robust unless they regularly experience the very tragedy of disruption that governance is designed to avoid. Given our increasing personal and geopolitical dependence on resources that stretch across vast regions and complicated dependencies, we would be wise to heed the fragility and complexity of our relationship with technology. Technology is the most powerful force shaping our world. As Kevin Kelley points out in "What Technology Wants", Of all the animals we've domesticated, the most important animal we've domesticated is us. We can think of technology as a 7th kingdom of life which we have created and on which we are now wholly dependent. According to Kelley, 3/4 of energy is now used to feed technology itself. Most of the gas in your car is used to push the car itself and data centers are on pace to approach lean household use. Still, we've done well. King Henry with all the wealth of England could not buy antibiotics, could not buy refrigeration, could not buy a same day trip of 1000 miles. In every prison are porcelain toilets and foam spring mattresses, two items once considered the most frivolous available luxuries. How quickly we adapt! Kelley asserts that technology wants to become more complex, more specialized over time, but it begs the question.. Can we be intentional rather than merely competitive in response to technological development? If we are truly dependent on technology shouldn't we periodically refactor it to be more robust, more modular, and freely available if we need it to thrive? Even more so than preceding open source movements, the significance of an open source civilization bleeds more strongly into governance and geopolitical hopes and fears. As our industrial revolutions brought us assembly lines and lifetime employment, the democratization of manufacturing is a strong continuation of the return to flexible self employment we've already seen, making more possible the American dream. In recent years we've noted the ease at which citizens can find and purchase from micro manufacturers on Etsy, Ebay and online web shops. One need look no further than Kickstarter to see the increasing market voting with dollars to purchase products made with particular values and for which a direct connection to and transparent interaction with the manufacturer/innoator is available. Eric von Hippel of MIT's Sloan School of Management defined the user-led innovation model in his book Democratizing Innovation. Among his conclusions is the insight that as innovation becomes more user-centered the information needs to flow freely, in a more democratic way, creating a "rich intellectual commons" and "attacking a major structure of the social division of labor". Democratizing and making accessible the means of production stands as an important method of improving the equity and distribution of material wealth that has been eroding, representing a floor that progressively reduces the level of material want and the need for welfare to maintain a harmonious society. Efficiencies made through IP are not guaranteed the same trickle down effect as open innovation through distributive enterprise. More importantly we have forgotten to ask ourselves.. As a citizen in a republic, does one truly have the means to dissent if they as a local group cannot control their means to the production and distribution of basic necessities?.. IE if the government controls food water and transportation.. how would one rebel? This is an important safeguard in governance across the world, but has largely been abandoned conceptually as a social value despite being deeply rooted in our founding psyche. This trend however is reversing as solar, micro wind power and open hardware make relevant again the concepts of Jeffersonian democracy in regions where individual citizens are currently without leverage and capability. As we have already mentioned, the nature of global supply chains create foreign policy dependencies that have been historically problematic in times of conflict. Today it is extremely difficult to imagine the availability of consumer goods if a significant conflict arose with China or other important manufacturing countries or natural resource locations. The United States no longer manufactures telephones, televisions, refrigerators and many of the other items we think of as staples, and many countries never have, but the manufacturing revolution stands to change that. Currently governments have a limited set of subsidy and other tools to promote self reliance when capitalistic efficiency optimizes beyond the point of constituent security. These tools are increasingly constrained by trade agreement and organizations such as the WTO. The United States has maintained itself as a net food exporter, but not all regions are so lucky. Cuba, as recently as the 90's, has a working memory of pulling its elderly citizens out of nursing homes to re-teach the young how to farm with oxen after the collapse of the Soviet Union made gasoline and other foreign accounts purchases impossible. Imagine if the developed world would have been asked to make this transition so quickly! If democratizing manufacturing capability is important in providing resilience to geopolitical disruption, it is essential in global scale natural disasters, pandemics and other severe governance challenges. Distributive Enterprise also represents an improvement in aid possibilities. As our wisdom on aid has matured from grain dumping (in the WTO sense) on distressed agricultural economies, there is a stronger interest in 'teaching a man to fish' through training and affordable user serviceable tools. Howard Buffett in particular has pointed out the consequences of sending developed world farm equipment to Africa where supply chains to repair it are not available. Tools like the GVCS increasingly enable aid programs to look more like a Marshall plan than an ill considered grain dumping exercise in the hands of a vampire state. For all its benefits, however, there are significant considerations in the local manufacturing revolution. Democracy of technology leads to more innovation and more fairness, but also more capability. In the United States recently, a man 3d printed the lower receiver to an AR-15 Assault Rifle using freely available CAD plans. The lower receiver is the part that is considered "the gun" while all other components such as the barrel can be freely traded on the market. While it has always been possible to machine a lower receiver on your own, this innovation points to a dramatically increased ease, and a severe limitation to, or at least re-thought of prohibitionist policies. While these and other manufacturing risks are credible, they seem rather pedestrian in comparison to other garage revolutions such as biotechnology, given the capability of molecular legos to affect human health. It is in this light that I like to view the re-introduction of distributive means of production: an important resiliency that we have been sorely missing since the industrial revolution. Congressional estimates of the pandemic flu of the early 1900's suggest that if we lost the same percentage of citizens in 100 year pandemics that biologists expect, we would completely lose infrastructure due to the social nature of disease vectors, and the extreme leverage of just a few citizens in providing interdependent power, water and network services to the rest. Despite improvements in public health and vaccine response, we have also dramatically increased travel, urban population densities, and dramatically decreased the percentage of the population without direct access to food, farming, and independent water supply. David Brin, author of "The Postman", a popularly adapted film with Kevin Costner describing the rebuilding of a society after such an event, has taken note of Open Source Ecology, and lauded its contribution to potential society, both in terms of resiliency and in avoiding what he calls the 'oligarchic attractor effect' in governance. Brin has also written a work called 'The Transparent Society' detailing the necessity to erode privacy in modern government and counter it by more thoroughly watching the watchers. Part of his justification for this long run outcome is what has been described as the "Mad Scientist World Destruction Index". This is simply a chart showing the decreasing effort and increasing accessibility to destroy the world over time as technological leverage increases. During the Manhattan project it required billions of dollars and a group of very high IQ scientists to create this power. They posit, however, after enough time, any teenager could sequence a 100% mortality virus or other technology and we are all doomed. What is left from this equation is the other side of the arms race in protective technologies and this is the light in which I view an Open Source Ecology and manufacturing sector. If in fact through power each year it is easier to destroy the world, each year you have to make a concerted effort to make it easier to save the world. Humans, it's thought, are wired for in-group out-group behavior and not for the nonaggression principle and other legitimate coercion free forms of government, but there is some reason for hope. Though society looked relatively similar through the last 10,000 years of human history, in the last 200 years technology has brought us from the covered wagon to the nuclear age. Images such as 'Earth from Space' and 'Pale Blue Dot', and movies such as Koyaanisqatsi, Baraka, and the recently released Samsara show this to incredible impact. In a similar regard, through the development of international travel and now the internet, what constitutes our neighbor and collaborator is is dramatically changing. By working and collaborating with individuals from across the globe to reduce material scarcity and the resource conflicts that come with it, we increase our chances of making it through a particularly testing time in our growth as a species. Many ideas about the future have been postulated and invested heavily in, from the Malthusian mindset to the technological singularity. Dystopian or utopian, equitable, or inequitable, the future retains a quality of being difficult to accurately predict. Proposed concepts like asteroid mining and molecular manufacturing through nanotechnology promise to allow us to arbitrarily reform our environment and eliminate scarcity. Diamond Mechanosynthesis posits that we can cheaply develop carbon hydrogen and germanium tooltips capable of placing arbitrary carbon atoms to build atomically precise macro scale structures made from diamond. Robots threaten to completely eliminate the labor force. While we can't say which future we will get, and what future technology is possible or necessarily desireable, we can say we want a robust and resilient core to our civilization and means of survival and material wealth available to ourselves and our children. We can make that wealth more widely available and environmentally compatible… and we can take intentional practical steps to end material deprivation and resource conflicts today. Today at Factor e Farm is a small living science fiction novel, reminiscient of David Brin's work. The farm is a contrast of a return to roots and a futuristic vision. The community builds its own housing, eats farm fresh eggs and produce, br(not our own) harkening back to agrarian society and values. Days of work, days of rest, patterns fit to the seasons and days. All around the work shop however are the industrial engines of production harkening back to yet another area. And still another contrast can be seen, as a developer in a flannel shirt bends down to update the software on an Arduino controller board. In the operation and at Factor e Farm, you can feel the consolidation of generations of human progress condensed back into cohabitation. The results of these and other related efforts can't be certain. The significance of the OSE toolkit and how it is used is as unclear as the future. Even now, the first large scale replication of the equipment is underway in Guatemala at a sugar cane plantation. The operation is interested in converting to OSE tools for production, and intends to build housing for workers with the compressed earth brick press. All of this is happening independently, and I think all of it bodes well for the future. This page was last edited on 5 August 2016, at 22:31.